and glorified God that gave such power to men." St. Louis Marie DeMontfort recounts the amazing power of the Rosary over evil spirits below, taken from his book, The Secret of the Rosary. This Catholic prayer has incredible power. 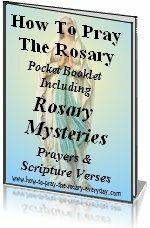 Everyone who reads this account will want to learn how to pray the Rosary. When Saint Dominic, who spread the devotion of praying the rosary, was preaching the Rosary near Carcassone an Albigensian was brought to him who was possessed by the devil. Saint Dominic put his rosary around the Albigensian's neck and asked the devils to tell him who, of all the saints in heaven, was the one they feared the most, and who should therefore be the most loved and revered by men. "Dominic, Dominic, have mercy on us - we promise you that we will never hurt you. You have always had compassion for sinners and those in distress; have pity on us, for we are in grievous straits. We are suffering so very much already, so why do you delight in heightening our pains? Can't you be satisfied with our suffering without adding to it? Have pity on us! Have pity on us!" Saint Dominic was not one whit moved by the pathos of these wretched spirits and told them that he would not let them alone until they had answered his question. Then they said they would whisper the answer in such a way that only Saint Dominic would be able to hear. The latter firmly insisted upon their answering clearly and out loud. Then the devils kept quiet and refused to say another word, completely disregarding Saint Dominic's orders - so he knelt down and prayed thus to Our Lady: "Oh, all powerful and wonderful Virgin Mary, I implore you by the power of the Most Holy Rosary, order these enemies of the human race to answer me." "Dominic, we beseech you, by the passion of Jesus Christ and by the merits of His Holy Mother and of all the saints, let us leave the body of this man without speaking - for the angels will answer your question whenever you wish. After all, are we not liars? So why should you want to believe us? Please don't torture us any more; have pity on us." "Then listen well you Christians; the Mother of Jesus Christ is all powerful and she can save her servants from falling into hell. She is the Sun which destroys the darkness of our wiles and subtlety. It is she who uncovers our hidden plots, breaks our snares and makes our temptations useless and ineffectual. When the devils had all been expelled and the heretic was at last entirely free of them, Our Lady (who was still invisible gave her blessing to the assembled company, and they were filled with joy because of this. St. Louis Mary DeMontfort has indeed given an impressive account of how powerful Mary's Rosary is in overcoming evil. 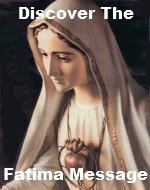 Satan and all the other evil spirits fear Mary because of her role as the Mother of God and because through her the Redemption of mankind was able to take place. Remember she was the Woman in the book of Genesis that God promised would crush the head of the Serpent. The power of the Rosary must never be taken for granted. It is a gift and a weapon given by the Mother of God to her children to bring about peace in individual lives and throughout the world. Spread this devotion and pray the Rosary everyday!